Clyde Fenton, aka “Doc Roc,” during a rehearsal in his Portsmouth home. Two of Doc Roc’s Remedies, Doug Parsley and Becky Climer, shared a corner during a recent band rehearsal. If you were are on the banks of the Ohio River Sunday night, you witnessed what has been described as a bit of a Portsmouth tradition by members of the River Days committee. No, not just the fireworks that marked the end of the four days of River Days, but the band that was playing just prior to the fireworks and, if things went as planned, during the fireworks. They play all around the area, at various events, festivals and private parties as well as performing for various charities such as Habitat for Humanity, the American Red Cross, Southern Ohio Medical Center Cancer Survivors and the American Cancer Society, among many other appearances. Over the years, during River Days, they opened for national acts such as the Marshall Tucker Band, Eddie Money, the Georgia Satellites, the Kentucky Headhunters and more. But for the last several years, led always by Doctor of Optometry Clyde Fenton, (a.k.a. “Doc Roc”) Doc Roc and the Remedies have closed out River Days, churning out classic rock and oldies prior to the Sunday night fireworks and in sync with those fireworks. During a laid-back rehearsal in the basement – a basement filled with Ohio State University football memorabilia – of Fenton’s Portsmouth home prior to Sunday’s headlining show, Fenton and four other members of his band explained why they have been together and playing music since 2002. “We all get along so well,” added guitarist and vocalist Doug Parsley. “We all love each other, but more importantly, we all like each other,” said keyboardist and vocalist Becky Climer. Fenton is, by the way, the group’s lead vocalist and guitarist. In addition to Parsley and Climer, the Remedies consist of husband and wife Bob (bass and vocals) and Carol Mascari (sax and vocals,) along with drummer Kevin Castle, who was absent for the start of the Friday night rehearsal. Climer and the Mascari’s are all retired music teachers or music directors from local schools. 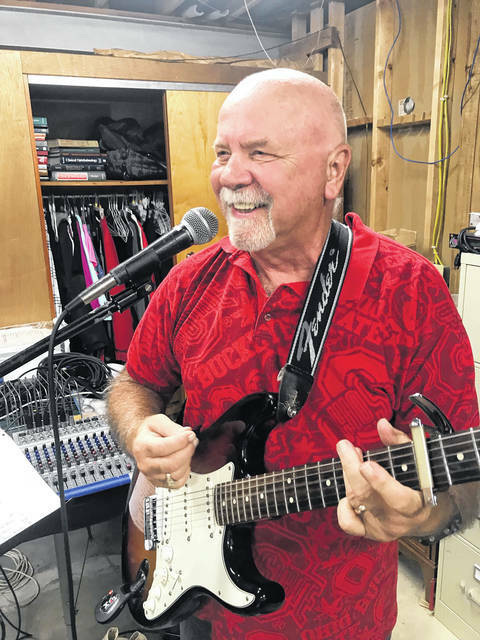 While his primary gig obviously is optometry, Fenton, 71, has been making music literally since he was a youngster. He shows off an old black-and-white photo of himself in his kindergarten days playing a ukulele. In 1966, Fenton and sister Hilda took their burgeoning “Clyde and Hilda” act to local TV, namely WOWK Channel 13’s “Talent Hunt.” That first year, the brother and sister lost out to future TV game show host Chuck Woolery, whom Fenton says is actually a very gifted singer and guitar player. Undaunted, the Fentons returned the following year and this time, singing “High-Heeled Sneakers,” won an appearance on Dave Clark’s national TV show “Where the Action Is.” They shared the stage with Tommy Rowe and Clark’s then houseband Paul Revere and the Raiders. Back in Portsmouth, Clyde Fenton went on to start a couple of different bands, including one which was labeled, at least in part, “The Very Exciting Banana Peppers.” He was also busy singing in a church choir. Of course, along the way, he managed to graduate from The Ohio State University with his medical degree and recently received a plaque honoring him for 50 years in his profession. “The only plaque I ever got was on my teeth,” quipped Parsley. It was one of many little jokes and jibes the group shared, along with a bottle of red wine, during their relaxed rehearsal. Fenton was asked how long they might be able to keep all this us up. “We plan about an hour,” joked Climer, referring to their rehearsal. “Until I fall over,” was Fenton’s answer. As the group warmed up so to speak, Fenton was happily showing off a new wireless guitar, one of about a dozen instruments he owns. He had nothing but praise for his fellow bandmates. “You need to get out more,” Parsley responded. For persons who attend Portsmouth’s Cornerstone United Methodist Church, Doc Roc and the Remedies might look very familiar. Fenton, Climer, and the Mascari’s all play in the church’s “Praise Band,” which provides Christian rock for the church’s contemporary service on Sundays. Those performances are very important to him, Fenton said. Doc Roc and the Remedies have released two full-length CDs, the latest entitled “Party Time.” One of their next scheduled performance is Oct. 27 at the Shamrock in Columbus during the OSU football game. They have other gigs lined up around Ohio as well as what seems to be an annual concert in Florida. You can learn more about the band and their appearances on the Doc Roc and the Remedies Facebook page. https://www.portsmouth-dailytimes.com/wp-content/uploads/sites/28/2018/09/web1_fenton.jpgClyde Fenton, aka “Doc Roc,” during a rehearsal in his Portsmouth home. 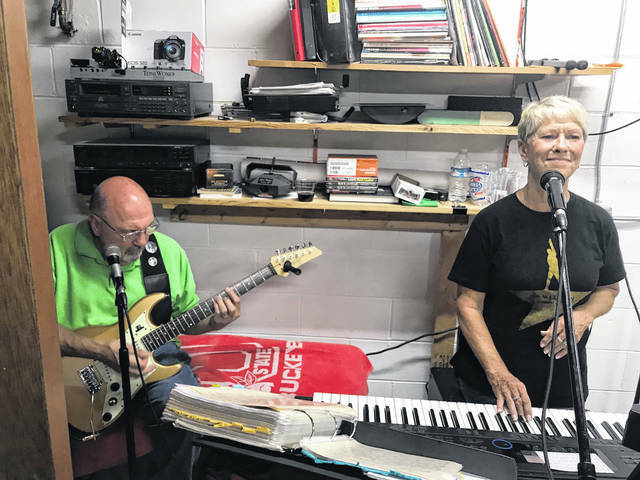 https://www.portsmouth-dailytimes.com/wp-content/uploads/sites/28/2018/09/web1_parsely-and-climer.jpgTwo of Doc Roc’s Remedies, Doug Parsley and Becky Climer, shared a corner during a recent band rehearsal.